Fall has finally arrived here in the Northeast (we had a few days that it began to feel like winter - rude), and I have been enjoying getting to wear some of my new fall purchases. Nothing feels as satisfying as new clothes for fall, right? I associate it with a new start probably because it's the start of a new school year though I have been out of school for more than a decade. Ha! I splurged on this pair of boots which I had my eye on for months and felt they were a great basic that would last me for years to come. However, there are a ton of great budget versions out there as well - these, these and these to name a few (as well as the ones I linked below). Since I don't have the smallest of ankles, I was worried about not being able to tuck my jeans into them but these Topshop jeans are so tight that it was a perfect fit! 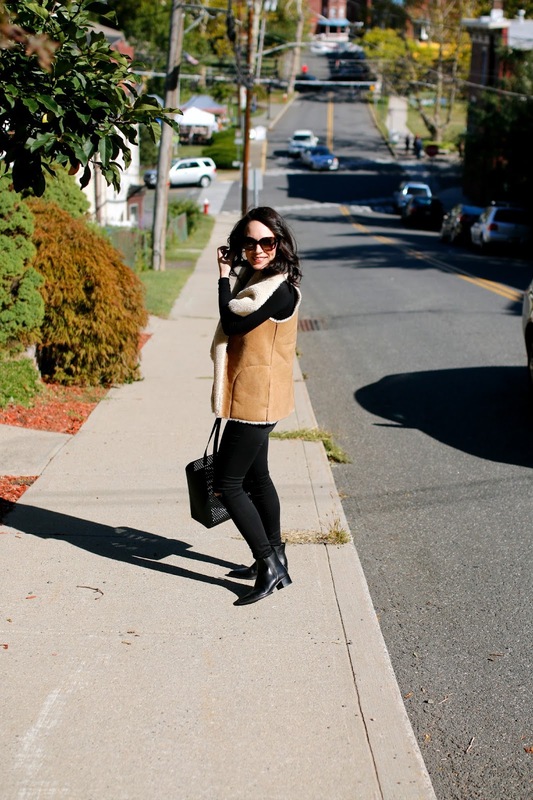 This was my first shearling (faux) vest and I am shocked I did not buy one sooner since it looks good with just about anything in my wardrobe. Speaking of wardrobe, did you watch my fall fashion favorites video? I didn't realize until I filmed just how many basics and favorite styles I had for fall. It's winter that is the sartorial Debbie Downer. Swooping in with all her bad weather and frigid temps making it nearly impossible to look decent. 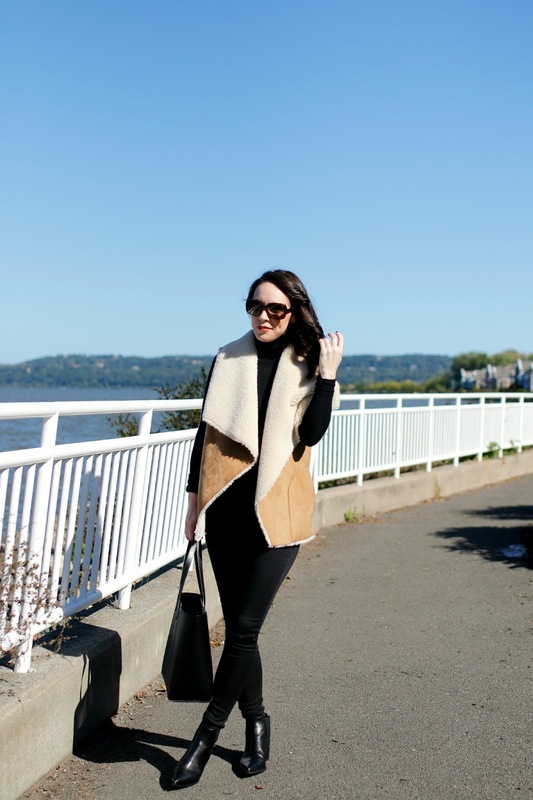 In the meantime, I will get every last bit out of fall I can (fashion-wise that is) so stay tuned! The whole look is perfection! You look amazing. I live in a place in Ca that never gets cold enough to wear such an outfit. I'm always praying for colder weather because fall outfits are my favorite. Anyway, have an awesome weekend.